I got one of these as a shower gift and I thought I liked the idea of basically carrying my baby in a purse. I loved taking walks and wanted to walk with my baby, so I thought this was the perfect solution! But when it came time to actually put him in it, it was awkward to tuck him in there. I was always checking him to make sure he was breathing. If he were to turn is face to the right, he would suffocate, so I walked awkwardly trying to make sure that didn't happen. If he was laying flat on his back, his chin would fall to his chest in a way that looked incredibly uncomfortable. So I put it up, ordered a different type of carrier for a different company, and then a friend of mine posted on my Facebook page that the carrier she had gotten us both for our babies was recalled because babies were suffocating!! I was not surprised, but I cut it so no one else could use it and threw it away. I would not suggest that anyone buy this or ANY sling type baby carrier that has them lay on their back. i like this carrier, and i find it good for my smaller baby, however it is not the greatest, i would reccommend spending a little more money for a good one. also, it si very hard to position and i would like one thats more versatile so i could use it longer. i am sure this would becomevery ncomfortable with an older or heavier baby, but mine is still small so it works for now. 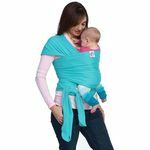 This sling is very comfortable for both mother and child. My son loved this because he got to be so close to me when I was busy running after my toddler. I likeed to be able to go to the park and walk around and not have to worry about carrying around the stroller everwhere. The only con I can think of is that sometimes his face was covered, but as he got bigger it wasn't a problem. This carrier is not safe for small children. It is too easy for the baby's face to get covered up by the heavy padding. This allows for re-breathing, which is extremely dangerous. It also is too easy for the baby to have their chin touching their chest, which cuts off breathing for the baby. This carrier is cheap and easy to find, but I would never recommend it nor would I allow friends or family to put their children in the carrier. There are many other options available that are safer and just as easy to purchase without the added safety concerns. I had one, My baby did not like it.. SO many times they are used incorrectly causing babies to sufficate..It is a good idea but not good at getting babies in the correct position causing them from having their chins tucked preventing them to breath.. When I tried using mine, It was uncomfortable on my back as well, not a comfortable ergonomical carrier at all. It was hard to get her in a position tha twas correct, IT never wanted to lay right and always covered her head and I felt she was going to slip right out of it unless I was holding on.. so It did not even serve a purpose of letting me get hands free for any amount of time.. Plus with all the recalls on this carrier, It should never be used again.. I bought this sling for my second child, and used it more with him than with my third child. He needed to be carried/held quite a bit, and this enabled me to do some essential things like prepare food for the rest of the family! With both children (#2 & #3), I only used this for a short period of time. Even though they would both fall asleep in it, they just always looked to me like they would be uncomfortable. Also, my shoulders would quickly start aching. #3 really disliked when the sling would swing away from my body (such as weeding the garden or if I bent to talk to another child). A homemade moby-style wrap held the babies more securely than any purchased carrier I've used. I still have this, and will likely use it again. I have a black-and-white one that I think is stylish and attractive. **One of my favorite uses is when taking a very young baby to a social situation in which I really don't want many people touching or holding him/her (such as during flu season). ** When the baby is encased in this sling, people are much less likely to touch or request to hold him/her. I can still cradle the baby in my arms so she and I are both comfortable, but the visual barrier is there. Summary: The Infantino SlingRider is useful & inexpensive, but not necessary, particularly if you lack storage space. This baby carrier gets a bad rap as you can see from the reviews and the over all score. If you use the carrier as a way to walk around the zoo with your baby this summer, you are going to regret it. If you use it for any long period of time, it is going to kill your back. Don't put your bundled baby in this carrier in warm weather. Be safe and use common sense when using this carrier. That being said, there are a few really nice things about this carrier. I used it to rock my firstborn to sleep when he was small. I snuggled him inside and walked around the house until he fell asleep. I made sure his face was not covered and that he was not over heating and it worked like a charm. He really enjoyed the rocking movement and the positioning. More so than other carriers. The other thing I used it for was cold weather. It kind of keeps the baby more protected than other more open types and it is easy to get the baby in and out. I never used it for long periods of time, even in winter, but I liked it for certain purposes. That all being said, if you are going to try this carrier for something like I have described above, then go for it. It is inexpensive and nice to have. Please make sure your baby can breathe easily and will not overheat. When my daughter was born 5 years ago, I heard wonderful things about the sling. I registered both for this and for the Baby Bjorn. The sling did not work for her at all. Some babies like being snuggled in and covered up, but my daughter hated having the sides wrapped around her. She would arch her back and never settle in. I also have some back problems, and the sling did not balance the weight so it caused worse back pain. When compared with the excellent design of the Baby Bjorn it does not even compare. 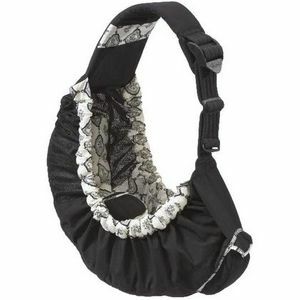 I have heard people say that they napped their babies in this sling and wore it all the time but I don't understand how it is possible. It was hard for me to keep it in place to be able to do anything but walk around or sit down with the baby in the sling. Also, since she never settled down in it it was hard to figure that out! I would not recommend this sling. If you want to try it, borrow it before buying! Infantino Sling Rider leaves much to be desired!!! I have many issues with this sling. For one it was recalled because it suffocated several babies. Besides that it is just not comfortable. There isn't enough padding on the sholder to make it a comfortable sling. It's big and bulky also, that is probably why it was a suffocation hazard. It's supposed to hold a baby who is 20 lbs comfortably and it definitely does not. I attempted putting my son in it when he was maybe 15-16 lbs and he wasn't fat by any means and he barely fit. He looked so uncomfortable in it he was just all smushed up. I immediately took him back out of it. This sling is also UGLY. Maybe if it came in different patterns it would look a little bit better, but I doubt it. The bulk of the large amounts of padding around the baby just make it huge. It's like wearing a bunch of pillows around a poor baby. The only part of this sling I did like were the straps to hold baby in. Other than that there were NO pros to this sling!! The Infantino Sling Rider is a 'bag' style sling that is just plain dangerous and never should have been on the market. 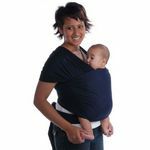 You cannot safely get a small or young baby in it due to the way they curl up, no visibility is given to the baby once they are in the sling and very little support exists. 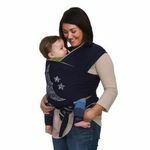 Searches online show that problems with these slings have been known for years, yet Infantino continued to sell them until recently, despite these concerns. Unfortuanately, those with no knowledge of baby carriers and babywearing see these on the shelfs at stores or are given one and think they must be safe since they are marketed as a infant carrier. Please, if you have one, know someone with one or see one for sell, let them know they are death traps for small babies and are recalled. Unfortunatley, many don't know and they continue to be used putting babies at risk. I have no respect for Infantino for making these slings for such a long period of time.